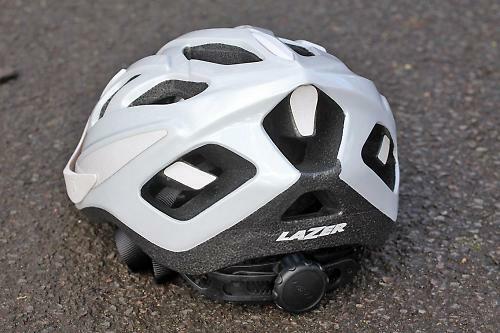 The Lazer Cyclone is an easy to adjust, good value helmet intended for road or mountain bike use. Its easy fit and good looks will attract all types of riders. The Cyclone is available in white, silver, red, flash yellow, matt black or matt brass, in medium or large sizes. 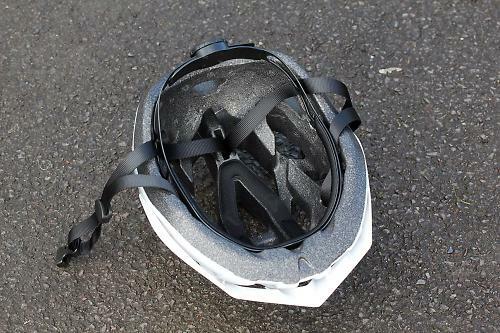 The fit, adjusted with a ratcheted plastic 'Turnfit' wheel on the back, is generous in that it allowed me to feel comfy in a medium helmet when I usually need a large to avoid a pressure point on the forehead. If measurements mean more to you, medium is 56-59cm, large is 59-61cm. An easy to adjust strap clamp just below the ears also allows you to pull through the fore/aft around-ear straps to make the fit secure enough to avoid that 'helmet way too far back on the head' look. The Cyclone is essentially a reasonably priced do-it-all lid that's at ease with all types of riding and rider. The one piece shell seems tough. 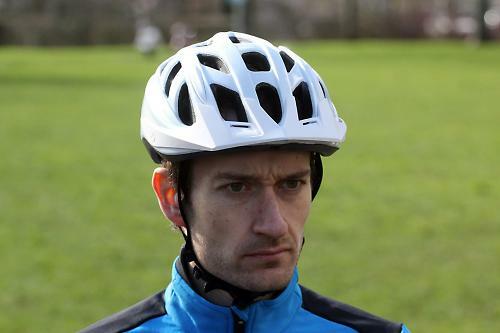 It has back and side reflective strips and there's a removable visor/peak to shield your eyes from the sun or the rain. Claimed weight is 290g. Ours weighed 305g. Either way, it's one of the lightest budget lids without any obvious compromises in build quality. There are nineteen vents for good air flow and there's just about enough padding to stop movement on bumpy terrain. And that's about it. 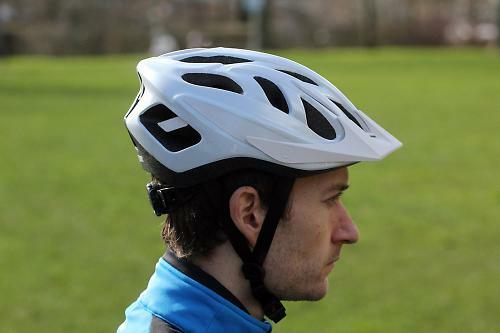 It's a comfy basic helmet that looks and feels good and passes all the safety tests. Comfy basic helmet that looks & feels good. "Offering great protection, style and comfort, the Lazer Cyclone is a fantastic option for the rider that needs a do-it-all helmet. Whether you're cruising around town, or for your weekend cycling activities"
For a helmet at this price, it's a great blend of low weight, sturdy construction and good looks. So far so good. Seems tougher than many high cost helmets. Snugness will depends on your head shape, but the rear skull cradle and Turnkey dial effectively makes it a two sizes fits all helmet. It's well priced and looks/feels the part. You might question the wisdom of ever paying more. Low price and easy to adjust fit. Would you consider buying the product? If I was in the market for a new helmet, yes. A simple, does the job, well priced lid.